A storybook ending it wasn't, but the racing world welcomed Hall of Fame jockey Victor Espinoza with open arms following a seven-month absence on a picturesque Monday afternoon at Santa Anita in Arcadia, Calif., as the 46-year-old native of Mexico City finished second, beaten 2 3/4 lengths aboard heavily favored Gallantlystreaming in the day's first race which was run at 6 1/2 furlongs down the Camino Real Turf Course. With fans hollering words of encouragement from Santa Anita's Paddock Gardens, through the tunnel underneath the Grandstand and on to the post parade, Espinoza expressed sincere appreciation to all those who have assisted him in his long road back from a broken neck, sustained in a training accident at Del Mar on July 22. It seemed fitting that owner, Hronis Racing, LLC and trainer, John Sadler would be the first to offer Espinoza a mount, as Victor had been the regular rider of their eventual Breeders' Cup Classic winner and older male Eclipse Award champion Accelerate, prior to the July 22 injury. Irish-bred Gallantlystreaming, who took a steep dive in class from three maiden special weight races and was in for a maiden $50,000 claiming tag today, was off as the 4-5 favorite in a field of 10 sophomore fillies. Breaking sharply from the far outside, she was quickly in-hand while mid-pack and although she mustered a good stretch rally, never threatened the winner, Queen of the Track, who sped to a gate to wire victory under Ruben Fuentes and paid $21.80 to win. Gallantlystreaming finished 1 ¼ lengths in front of A Dime for Me and paid $2.80 and $2.40. Although he had but one mount today, Espinoza, a winner of the 2015 Triple Crown and a total of three Kentucky Derbies, remains hopeful he can again “smell the roses” on the first Saturday in May. “It was great, it was a fun ride. She ran great and you can't ask for much more. We got the first race out of the way and now we've got to go on and find the next champion. I wasn't nervous; I was kind of excited (going to the gate), excited to know I came back and could continue my career. “I thought we had a little chance (to win going through the stretch) but the winner was too far ahead of me and too tough to catch. But my filly ran pretty good and I feel great. “It was a big question not only for other people but for me, as to whether I could make it back. I couldn't even walk 20 or 30 feet without getting tired, and now, to have recovered after seven months, it's just an unbelievable feeling on my part. Not so much to come back and ride, but that my health has come back 100 percent. “It's a lesson learned to never give up. Our health is the most important thing and you have to keep going. After I had my accident (July 22, 2018)it was just ups and downs, like a roller coaster. There were days I felt good, days I felt bad, days I felt I would come back and days I felt I wanted nothing to do with racing. “But mentally, you have to be strong, and it's very important to have support from the fans and the people around you. I appreciate that; I appreciate everything. Basically, I appreciate everything in life. I go day by day and continue my career surrounded by a lot of happy people. It feels great. It's always good to have that much support from everyone and health is most important and I'm ready to go. “I don't even want to remember what happened that day, I try not to remember. It was bad. I was really in bad shape, that was the worst accident I could ever experience in my life and it was not easy, but thanks to all the help and everyone that was around me, they supported me. But I also had to do a lot on my part and just keep going, just never give up and the only reason I did that (was because) I wanted to feel better, I wanted to feel like before, I want to do things on my own, and do all the things I want to do. It was not easy but you know what? Everything pays off and I am here. “John has been a big supporter of my career and we have had a lot of success together and I can't thank enough for him because he put me in the first horse to work and he also put me in the first race, there are many others maybe who still so not have much confidence in me that I may not be ready to race but there all there to see me ride in the first race, and Joh had no problem with that so he put me in this one and hopefully I can win. 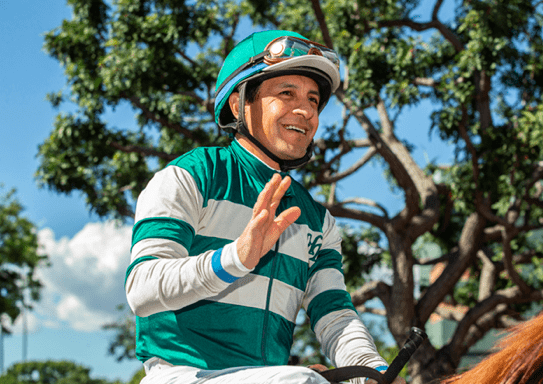 This entry was posted in NL Article, People and tagged Gallantlystreaming, Hronis Racing LLc, jockey injuries, john sadler, santa anita, Victor Espinoza by Mike Willman/Santa Anita. Bookmark the permalink.